Whenever John King, USA hits the road, one of the most important things a producer can do is make sure everyone in our road family gets at least one good meal a day. Some days, we are all more successful than others. When all else fails, we are great connoisseurs of fast food and quick sandwiches because we have to drive between locations. On Monday, we ran around during the morning following the Labor Day Parade in Pittsburgh. There were more people on this trip than usual. Dana Bash, Jessica Yellin and Gloria Borger joined us on this trip. During the day, there were too many people to work in the Election Express. Fortunately, there were businesses near by that we split up and spread out. In the afternoon, DiFores Ice Cream Delight dropped off two grocery bags full of soft serve ice cream. Right before show time, it was the perfect treat. I opted for the pistachio and vanilla swirl. This trip required us to work all day preparing for the show. Then post show, we would drive onto the next city. The distance between Pittsburgh and Columbus is three hours and then Columbus to Covington is another two. Our first night drive was that Pittsburgh to Columbus long haul. We had a brief time between the show and John¹s live appearance on AC360. There was going to be no sit down dinner that night. Instead of the usual fast food, we stopped for two slices at Giovanni's Pizza and Pasta. It is was near our hotel and always busy. Sometimes, that is the best gauge of where to pick a place. The crust was crispy and thin. It filled us up and on we went. The Columbus segment of the trip was well researched and we had more time. Susie Xu, a JKUSA producer was on the trip and got in contact with a friend who lives in Columbus. Personal recommendations have never been wrong. We ended up having lunch in a neighborhood called German Village and spent the rest of our day eating there. We had lunch at the German Village Coffee Shop. John had a breakfast selection while Susie and I went with lunch. My BLT was substantial and the fries were the perfect compliment cooked crispy. While we were walking out, Susie and I noticed Bakery Gingham ­ a wedding cake, cupcake and ice cream shop next door. We purchased two dozen cupcakes to bring back to the CNN Election Express for everyone to enjoy. I can tell you in many years on the road, this was a first. Usually, our treats consist of beef jerky, pretzels and nuts. The Bakery Gingham special cupcake was in honor of the first football game of The Ohio State University. "The Buckeye Nation" is a chocolate cupcake with butter cream peanut butter frosting. But, that is not the best part. The center holds a buckeye. No, a real poisonous nut isn't in there. Rather, it is the chocolate and peanut butter candy version. The cupcake is rich, but well worth the indulgence. They were the first four to go out of twenty-four. Dinner was an experience that we all will talk about for years to come. Photojournalist Jeremy Harlan enjoyed the "Thurmanator" at the Thurman Café. If you remember the 1980's movie, the Great Outdoors and John Candy versus the "Old 96er" you will get the idea. 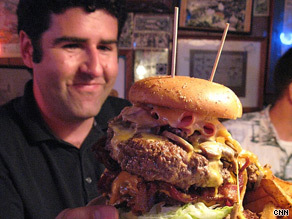 The "Thurmanator" is a majestic burger that stands close to 6 inches in height. There are two patties, bacon, ham, mayo, tomato, onions, pickles and loads of cheese. Jeremy ate the burger and skipped the fries. But, like the "Old 96er" in the movie, Jeremy got the free t-shirt for finishing his burger. The last night was my favorite meal. During the 2008 campaign, I discovered the simple treat of fried pickles. Any photojournalist that comes to Covington, Kentucky with me knows that we will have one meal at the Behle Street Café near our hotel. I ordered two plates of the deep fried delights for the table to share. There were twelve of us on the crew celebrating our last show. The Behle Street Café does their pickles as pickle chips with a light breading. I couldn't tell you what the dipping sauce is because I usually enjoy them straight. And my secret to eating all these treats: The hotel gym. John King is teaming up with Gowalla, the location based mobile and web service, to share his experiences from the road. Last year, John visited all 50 states following President Barack Obama’s inauguration and sat down with residents in local diners to hear their stories and discuss important issues. John has compiled his favorite diners for Gowalla and you can now visit them as well. To participate and see the trips John has created, Gowalla users should follow John by going to John King, USA’s Gowalla page and clicking the "follow John King, USA" button in the right column. You will then have access to John’s custom Trips at Gowalla.com or on your smartphone via the Gowalla app.